Rothmans Cigarettes Online for Australian customers! The brand was introduced in 1890 in London. The creator wanted to introduce a cigarettes brand that was of the highest quality. Later the company was bought by Philip Morris International, but the brand retained that supreme British quality. 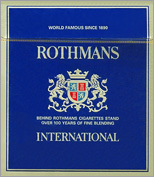 Rothmans cigarettes can be purchased on the Internet. Our online store offers this tobacco product at a very good cheap rate. Buying Rothmans cigarettes online will save you money and will allow you to try a great quality cigarettes product.